At Oneness-Family School, World Water Day and the theme of water scarcity was the focus of our weekly community meeting on Friday morning. We presented some of Ariane's video footage of the Azawak. The movie showed the muddy marigot toward the end of the rainy season, where people, particulary children, travel about about one hour from camp every day to dig under the adobe for water. We also showed a very special video of Ariane Kirtley introducing Amman Imman. You can view and download this video on the Amman Imman website. The Azawak is a region affected by permanent water scarcity and because of this problem there is a constant struggle to obtain water, whether making the hour trip to the marigot during the rainy season or the 17 mile journey to reach a working well on the outskirts of this large region. 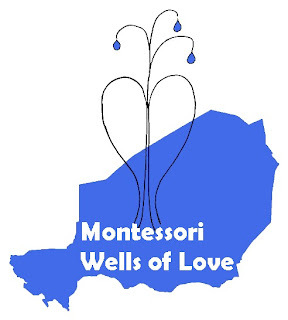 A Month Without Water, a worldwide campaign for April 2007 sponsored by Montessori Wells of Love to raise awareness and funds for Amman Imman. Please click on this link for more details about this campaign: A Month Without Water. A Walk For Water, a collaborative fundraising walk for students, sponsored by Montessori Wells of Love to engage students in working together for the people of the Azawak. In the Washington, D.C. area, Oneness-Family School and the Barrie School will be jointly sponsoring A Walk For Water on May 12. In teams of 8 or more (or as individuals), students, with their families and friends, will walk the 3.25 miles around Lake Frank in Derwood, Maryland, in collaborative support of the children in the Azawak. Other schools will be invited to join us. For a more detailed description of A Walk For Water, please click on this link: A Walk for Water. Stay tuned to this blog for further details about A Walk For Water in the DC area! We invite other schools around the world to sponsor A Walk For Water in their community! For help in planning your event, please contact debbie@ammanimman.org. We will soon be posting a promotional flyer and sponsorship sheets for students that can be downloaded through the blog to aid you as you organize your Walk. Our vision is to have several walks happen in May around the same time as our children unite to walk for the children in the Azawak!